Cut avocado in half lengthwise; remove pit. Peel avocado halves. Place 1 avocado half, butter and 1 teaspoon of the lime juice in food processor bowl with metal blade; process until smooth, scraping down sides of bowl as necessary. Stir in cilantro. Shape mixture into log or place in small dish; cover tightly with plastic wrap and refrigerate. Brush remaining avocado half with remaining teaspoon lime juice; set aside. Heat grill. In small bowl, combine chili powder, garlic salt and cumin; mix well. Rub mixture on both sides of each tuna steak. When ready to grill, carefully oil grill rack. Place tuna on gas grill over medium-low heat or on charcoal grill 4 to 6 inches from medium-low coals. Cook 10 to 14 minutes or until fish flakes easily with fork, turning once or twice. 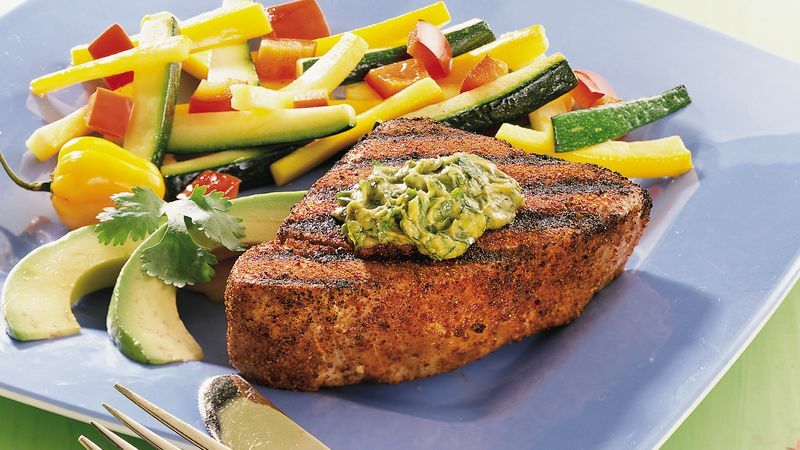 Serve tuna with cilantro-avocado butter. Cut remaining avocado half into lengthwise slices; serve with tuna. To broil tuna, place on oiled broiler pan; broil 4 to 6 inches from heat using times above as a guide, turning once or twice. Salmon or halibut steaks can be used in place of the tuna. Tuna is an excellent source of Omega 3 fatty acids, and avocado is high in monounsaturated fat. Both food components may help to reduce the risk of heart disease. A blender can be used instead of the food processor. Combine the ingredients as directed; cover and blend until smooth.